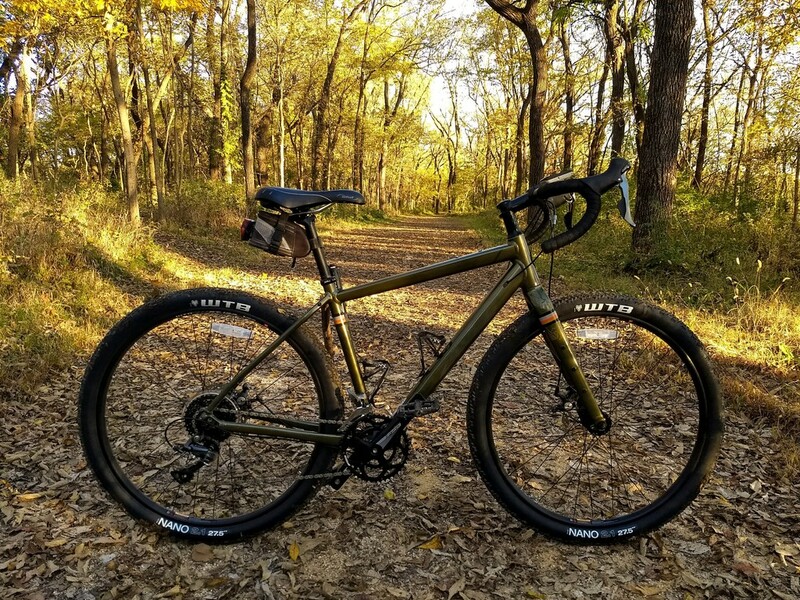 I’ve now put about 750 miles on my Salsa Journeyman, so I thought I’d check in and share my impressions of the bike. Longest ride was about 64 miles, along with a few gravel rides in the 20-50 mile range, but most rides have just been short jaunts around town. I swapped out pedals and saddle immediately, everything else was pretty much stock for quite awhile. The ergonomics were spot-on right from the beginning. I didn’t have to adjust handlebar, stem, brake/shifter levers at all. The bike fits extremely well. I don’t feel stretched out or compressed; very neutral. The integrated brake/shifter levers have worked fine, for the most part. The rear derailleur started shifting poorly eventually, but a few twists of the barrel adjuster, and it’s been fine since. It took a little while to acclimate to the shifting, but it feels pretty natural now (though I still get the up/down direction backwards once in awhile). The aluminum frame and fork ride fine. No complaints whatsoever. The disc brakes, though relatively low-end cable-actuated mechanisms, have worked flawlessly. They feel fine. The stock bike was pretty portly, and definitely sluggish-feeling. Slow to accelerate, but holds speed well. I think that comes down to a relatively heavy wheelset, and very heavy tires. Other than slow response, the bike handles very confidently. Not at all twitchy. Very neutral. I do get occasional toe overlap. I’m not a fan of the WTB Nano 27.5×2.1 tires: slow, heavy, stiff. At some point I realized that if I ever had a flat, they would be a bear to fix on the road. The tires were extraordinarily difficult to get off and on the rim. Note that these are the “comp” wire-bead non-tubeless version; perhaps the tubeless folding version would be better. I swapped over to Panaracer GravelKing 650×48 tires, and set them up tubeless, which was surprisingly easy, with just a floor pump. I saved 1.5 pounds just with that change. Much better. I purchased a second wheelset, a set from Quality Wheels, with Velocity Aileron rims and Formula hubs. I used an old pair of WTB Resolute tires (700×42) and set them up tubeless (again, a fairly easy and painless process). That wheelset/tires combo is about 2.5 pounds lighter than stock, even with a heavier 11-40 cassette. Both the 650 GravelKing and 700 Resolute setups have a much better feel than the stock Nano tires. Snappier, but just as comfortable. I attached a rear rack for a bit, and it worked OK. Probably not planning to run it that way very often, but good to have the capability. I’ve not had much luck finding a front rack for the Journeyman. I wanted something that was just a simple platform, where I could attach a Wald basket. The Journeyman fork has lots of mounting points, but it turns out that they don’t match up very well with commonly-available racks. I ended up ordering a Soma Lucas rack, and I eventually got it mounted up, but it’s not a particularly good fit. It’s a shame that Salsa didn’t include “shoulder” mounts for use with something like the Surly 8-Pack Rack. Salsa unfortunately doesn’t offer a front rack (other than low-riders). I’ve not yet purchased fork-mount cargo cages. I’m torn between the Salsa Anything Cage HD and the Topeak Versacage. Likewise, I went back and forth on handlebar bags. I kinda liked the Salsa Anything Cradle, but it’s pricey for what it is. I wanted to get the Revelate Harness, but it wasn’t available through my bike shop. I ended up buying a Zefal Adventure F10, which is kind of generic, but looks functional and has the virtue of being reasonably priced. I’ve not yet settled on a seat bag. I have an old Kada Pack Ratt bag, which I may try to use for awhile before getting something better. For the frame bag, I’m using an old Bushwhacker Tahoe. Not a great fit (it half-blocks one of the water bottles), but it’ll do for now. I bought another Moosetreks Stem Bag. I bought a generic stem-mount Garmin mount, and that works pretty slick. I’m using an old Planet Bike clip-on fender on the rear; it sort of works. The paint on the frame has not been great quality, with minor chips in several places. But it’s aluminum, so at least I don’t have to worry about rust. 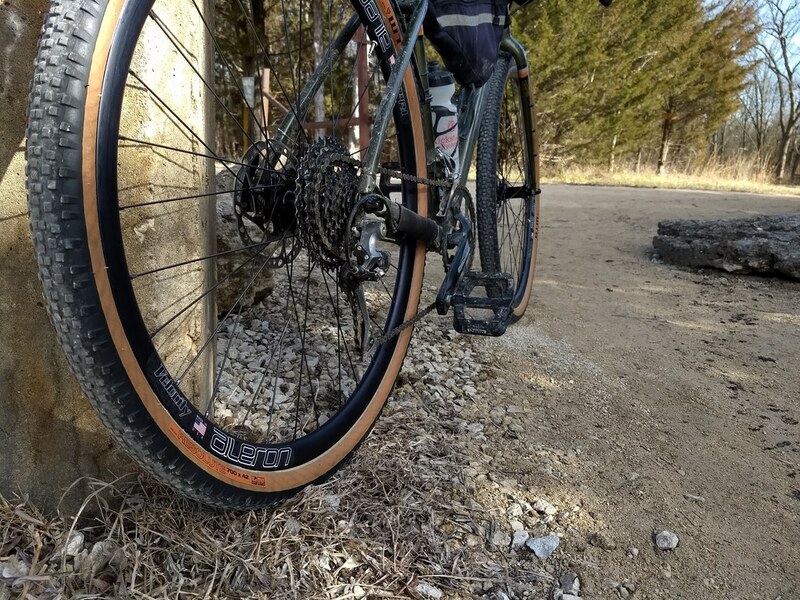 I’m thinking the 650b wheelset will be for touring/bikepacking, and the 700c for gravel and faster-paced rides (maybe with less-knobby tires, at some point). At this point, I’m pretty well set up for some bikepacking adventures this summer. Still need to work out some details on the kit, but that’s part of the fun. But the bike itself, I’m pretty pleased with. Other than the heavy wheels/tires, and the disappointing front rack situation, it’s good. Need to get in some long gravel rides, and some long loaded rides, before I can say anything more definitive, but I’m pretty optimistic that this bike was a good choice. Salsa Journeyman, pretty close to stock. 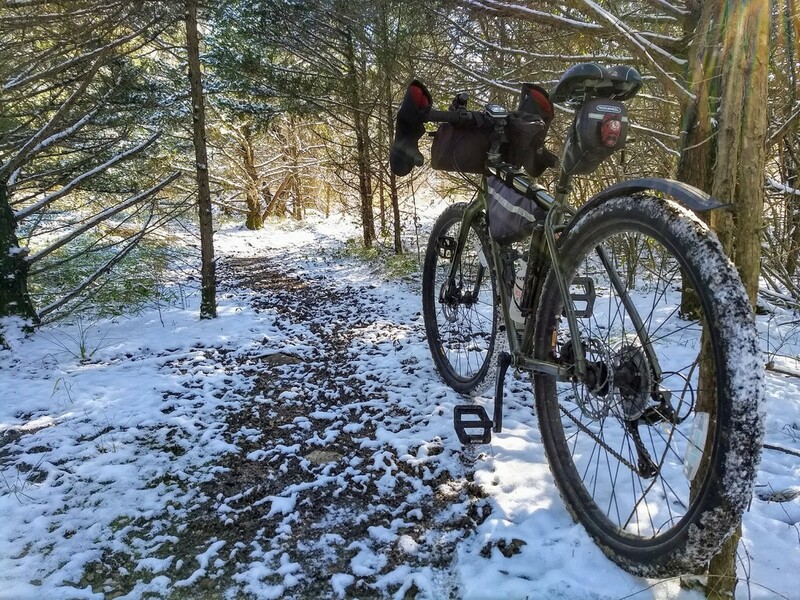 The Journeyman in the snow. I actually like the bike in mountain bike mode. 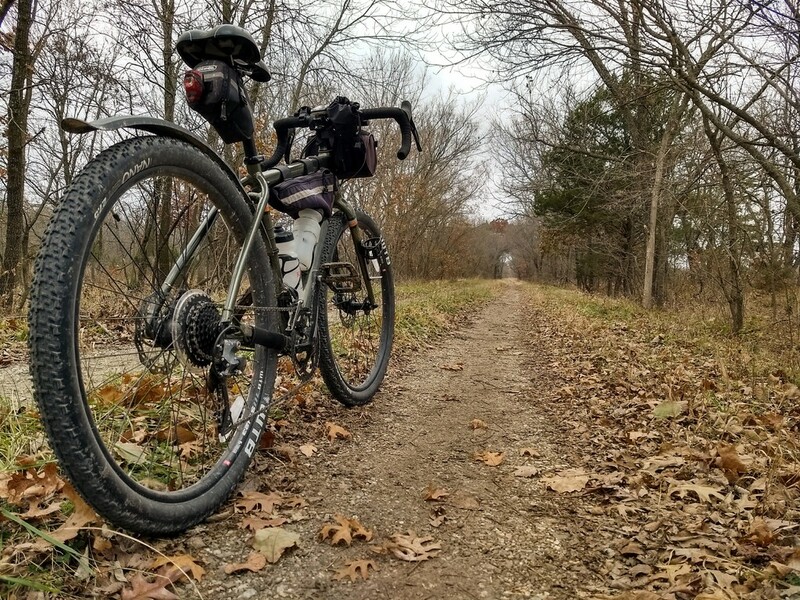 The Salsa Journeyman on a primitive gravel road. 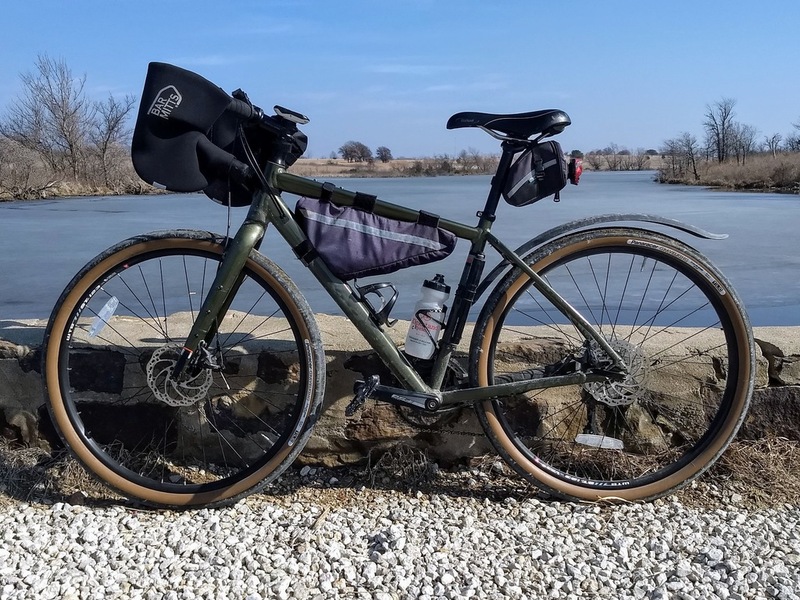 Salsa Journeyman with 650×48 Panaracer GravelKing tires. Salsa Journeyman with Velocity Aileron wheelset and WTB Resolute tires. I don’t have many miles on either the GravelKings or Resolutes yet, so time will tell how I end up liking those tires. But so far, they’re both far better than the WTB Nano’s. Thank you very much for the review. Are you using an 11-40 cassette with original Claris derailleur? How does it work? Yes, the bike has a long-cage derailleur, so the 11-40 cassette dropped right in and works fine with no modifications, shifts as well as the original. Slightly heavier than the stock 11-34 cassette, of course.